Have your breath taken away by the magic of this loft-like home in the heart of the Upper East Side. Enjoy the splendor and peace of effusive New York while peering through oversized windows facing South and East. The 9-foot ceilings contribute to the warm feelings of light, space and air, and the quiet promotes zen-like peace. Aaaahhhhhh. Impeccable upkeep and care are delivered by the building?s full-time staff that welcome you home with a smile.This fantastic property doesn't feel like an alcove studio, because it features many clearly defined spaces - an entry foyer where one can imagine a desk, as well as dining, living, sleeping and dressing areas. 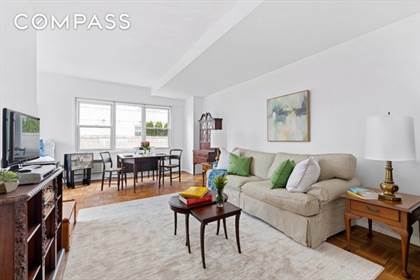 Although the kitchen and bathroom are in pristine condition, they are original, and so you'll probably want to give them a facelift.Your new home is ideally conveniently located only a couple of short blocks from the 86th St. Lex 4/5/6 subway and the 2nd Ave Q lines. Great restaurants and shopping are just down the block. And classic New York (Central Park, The Metropolitan Museum of Art, ie) beckons from the West. Grab a book from Barnes & Noble and a pastry from By the Way Bakery just around the corner and enjoy your spring day in Manhattan.What really sets this one apart from the rest is that it just feels like home. You must experience this as words will not do it justice. Visit, fall in love and make it yours! Hi, I'd like to find out more information about 144 East 84th Street. Thanks so much!